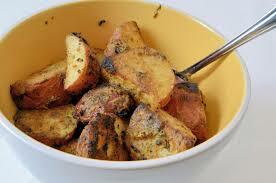 My new favorite way to cook taters with tasty results that go well with anything! Arrange potatoes in single layer, cut side down, in 12-inch nonstick skillet. Add water, butter, garlic, herb of choice and salt; bring to a simmer over medium-high heat. Reduce heat to medium, cover and simmer until potatoes are just tender, about 15 minutes. Remove lid and use spoon to remove garlic to cutting board; discard any whole herb stems (thyme, oregano, marjoram). Increase heat to medium-high heat and vigorously simmer, swirling pan occasionally, until water evaporates and butter starts to sizzle, 15-20 minutes. When cool enough to handle, mince garlic to paste. Transfer paste to bowl and stir in lemon juice and pepper. Continue to cook potatoes, swirling pan frequently until butter browns and cut sides of potatoes turn spotty brown, 4 to 6 minutes longer. Off heat, add garlic mixture and chives and toss thoroughly to coat.